Flavour, made with all natural spice and herbs delivering strong flavors and consistent dishes. Time, ready made mix and easy to use saving time, effort and money. Knorr Far East Seasoning is the perfect all in one spice mix for your eastern dishes delivering authentic flavours. Sprinkle seasoning mix to suit desired taste before cooking, for best results add the mix half an hour before. You could also Sprinkle seasoning mix just before serving. 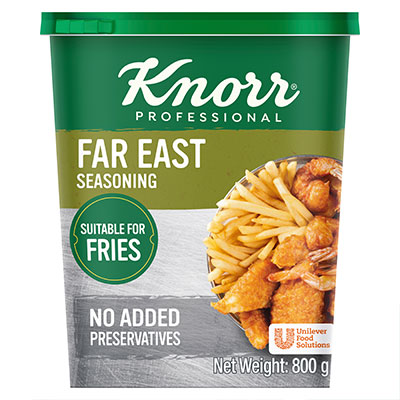 Use Knorr Far East Seasoning to season your French Fries or Mashed Potato and serve new exciting flavours for your guests.